What is the deal with bone broth & why should you be drinking it? 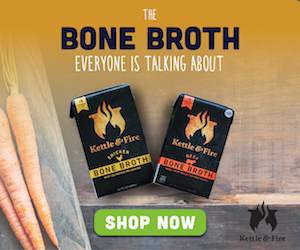 Have you heard of bone broth? Maybe you’ve heard it mentioned but aren’t quite sure what it is. Or why it is so highly praised by many. Bone broth is simply a liquid obtained from boiling bones from chicken, turkey, pork or beef in water. The biggest difference between bone broth and regular stock is that bone broth is cooked a lot longer. The end result is a tasty liquid that’s delicious on its own, but also makes a wonderful and nutritious base for soups and stews. It’s tasty, frugal and good for you. The nutrition benefits are one of the main reasons people make and consume bone broth regularly. When you boil bones for a long period of time, you leach all sorts of nutrients, minerals and other things that are good for you like glucosamine and collagen. Bone broth is full of minerals including magnesium and calcium. The fat content in the broth helps our bodies absorb the various minerals. It’s also full of collagen and gelatin which are good for your skin, hair and joints. It’s also great for your immune system. Remember grandma making a big pot of chicken soup anytime someone would get sick? The same principal is at work here. Think of bone broth as a more concentrated version of Grandma’s healing soup. The broth has even shown to help you sleep better at night. It’s pretty easy to make bone broth. Keep it simple and take the bones (like those from that leftover chicken or turkey carcass sitting the fridge), cover it with plenty of water and simmer for several hours. How long to cook your broth is up to you. 12 hours gives you a good, decent broth. Cooking it even longer makes it even richer in nutrients. If you’re using the bones from a roasted chicken, consider tossing them in a large crock pot and making your broth right in there. They can safely bubble away as you go about your day. So how do you consume the bone broth then? You can drink the finished hot broth as is, season it up with your favorite herbs and spices. Or use it to make a pot of soup or stew. The cooled broth can be stored in the fridge for about 4 days or in the freezer for up to a year.